Digital transformation is more than just a buzzword, it’s become a necessity in order to compete in the modern era. At the heart of digital transformation is real-time data. Your organization must respond in real time to every customer experience transaction, sale, and market movement in order to stay competitive. 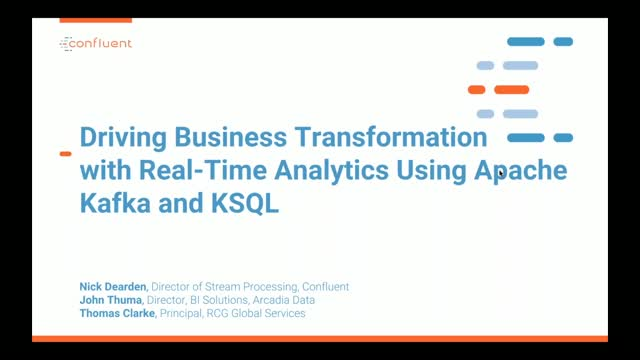 Streaming data technologies like Apache Kafka® and Confluent KSQL, the streaming SQL engine for Apache Kafka, are being used to detect and react to events as they occur. Combining this technology with the analytics insights from RCG and visualizations from Arcadia Data delivers a powerful foundation for driving real time business decisions. Use cases span across industries and include retail transaction cost analysis, automotive maintenance and loyalty program management, and credit card fraud detection. Join experts from Confluent, RCG and Arcadia Data for a discussion and demo on how companies are integrating streaming data technologies to transform their business. In this all too fabulous talk with Ticketmaster, we will be addressing the wonderful and new wonders of KSQL vs. KStreams. In this session, we’re going to delve into all these issues and more with Chris Smith, VP of Engineering Data Science at Ticketmaster. Most companies start their cloud journey with a new use case, or a new application. Sometimes these applications can run independently in the cloud, but often times they need data from the on premises datacenter. Existing applications will slowly migrate, but will need a strategy and the technology to enable a multi-year migration. In this session, we will share how companies around the world are using Confluent Cloud, a fully managed Apache Kafka service, to migrate to AWS. By implementing a central-pipeline architecture using Apache Kafka to sync on-prem and cloud deployments, companies can accelerate migration times and reduce costs. In this session, we will share how companies around the world are using Confluent Cloud, a fully managed Apache Kafka® service, to migrate to Google Cloud Platform. By implementing a central-pipeline architecture using Apache Kafka to sync on-prem and cloud deployments, companies can accelerate migration times and reduce costs. When it comes to the fast-paced nature of capital markets and IoT, the ability to analyze data in real time is critical to gaining an edge. It’s not just about the quantity of data you can analyze at once, it’s about the speed, scale, and quality of the data you have at your fingertips. Modern streaming data technologies like Apache Kafka and the broader Confluent platform can help detect opportunities and threats in real time. They can improve profitability, yield, and performance. Combining Kafka with Panopticon visual analytics provides a powerful foundation for optimizing your operations. Use cases in capital markets include transaction cost analysis (TCA), risk monitoring, surveillance of trading and trader activity, compliance, and optimizing profitability of electronic trading operations. Use cases in IoT include monitoring manufacturing processes, logistics, and connected vehicle telemetry and geospatial data. In this webinar, learn from field experts as they discuss how to convert the data locked in traditional databases into event streams using HVR and Apache Kafka®. They will show you how to implement these solutions through a real-world demo use case of microservice adoption. -The architecture of the Generali Connection Platform, including Confluent, Kafka, and Attunity. In this online talk, you’ll hear about ingesting your Kafka streams into Imply’s scalable analytic engine and gaining real-time insights via a modern user interface. Many enterprises faced with silo’ed, batch-oriented, legacy systems struggle to compete in this new digital-first world. Adhering to the ‘If it’s not broken don’t fix it’ mentality leaves the door wide open for native digital challengers to grow and succeed. To stay competitive, your organization must respond in real time to every customer experience transaction, sale, and market movement. But how do you get there? First, you must change your mindset. As streaming platforms become central to data strategies, companies both small and large are re-thinking their enterprise architecture with real-time context at the forefront. Monoliths are evolving into microservices. Datacenters are moving to the cloud. What was once a ‘batch’ mindset is quickly being replaced with stream processing as the demands of the business impose real-time requirements on technology leaders. In 2010, LinkedIn began developing Apache Kafka®. In 2011, Kafka was released an Apache open source project. Since then, the use of Kafka has grown rapidly in a variety of businesses. Now more than 30% of Fortune 500 companies are already using Kafka. With 3.6 million paid print and digital subscriptions, how did The New York Times remain a leader in an evolving industry that once relied on print? It fundamentally changed its infrastructure at the core to keep up with the new expectations of the digital age and its consumers. Now every piece of content ever published by The New York Times throughout the past 166 years and counting is stored in Apache Kafka®. Join The New York Times' Director of Engineering Boerge Svingen to learn how the innovative news giant of America transformed the way it sources content while still maintaining searchability, accuracy and accessibility through a variety of applications and services—all through the power of a real-time streaming platform. We provide a central nervous system for streaming real-time data. Confluent, founded by the creators of open source Apache Kafka®, provides the leading streaming platform that enables enterprises to maximize the value of data. Confluent Platform empowers leaders in industries such as retail, logistics, manufacturing, financial services, technology and media, to move data from isolated systems into a real-time data pipeline where they can act on it immediately. Backed by Benchmark, Index Ventures and Sequoia, Confluent is based in Palo Alto, California. To learn more, please visit www.confluent.io.